Welcome to my new website which will include this blog where I hope to keep a record of my artistic efforts and journey. At the moment its very much in its infancy. I will eventually add a gallery of images but until then its a work in progress. At the moment I paint most days, usually for 1-4 hours a day depending what other priorities come up. 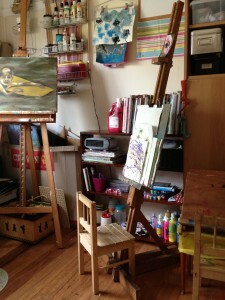 I have a small studio space in my home and I know I am very blessed to have it. For a long time I squeezed into the smallest spare space (shed, kitchen table, patio, lounge coffee table) for anything creative but now I have this wonderful room which is large enough to set up an easel or two for my daughters. Right now I am working on a painting which I may or may not enter into a local art prize as well as ruminating about how to finish off a painting for the Gallipoli Art Prize. I had better get onto it as entries are due in very soon! Thanks for dropping by, I appreciate you sharing this journey with me (and apologise for those times when the path is uphill or even veers off in the wrong direction! ).